Summer is my favorite season, but Christmas is by far my favorite time of year. Come October I'm ready to play my Christmas albums and aching to get out the Christmas decorations. Multiple trips to various stores - anywhere that has a Christmas display are made by our family. It's all I can do to contain myself until the day after Thanksgiving! There is so much about Christmas that I look forward to. From the glorious Michigan weather that usually (hopefully) includes snow - to the twinkling lights that so many have outside their houses. Family get togethers, the smell of pine needles, candles lit, cocoa, cold weather, and traditions galore. The traditions. That is one of my favorite aspects about Christmas. The die hard traditions that get passed from one generation to the next. It's a time to teach your children about Christ and how important his coming to earth was. A time to celebrate childhood and be some what of a child yourself. I remember when my brothers and I were little, when we still lived in the Town House listening to Manheim Steamrollers and having "our" songs. My brothers and I would take turns solo dancing to each song and acting out scenes. I can still see my brother's crazy dance that he did every time one particular song came on. I, on the other hand was super cool and pretended I was part of a wolf pack and howled like a wolf through one entire song. I know you wish you were as cool as me. My mom has the most amazing angel collection I've ever seen. It's breathtaking when she has all her angels out on display. They are everywhere! From the tops of the windows, to the mantle, on all the shelves. It's beautiful. She's helped me to start my own collection, and I must admit that every time I get a new angel I am pretty ecstatic. Most of all I'm reminded each year of what Christmas is really all about. It's a time of year to celebrate. It is a time of year to have reverence for the miraculous gift that God gave us in sending his only son. It can be easily overlooked and forgotten in the midst of the rush of Christmas and everything it is commercially portrayed to be. We can get caught up in the scramble, trying to get everyone presents, bake the Christmas dinner, clean the house for guests. All that is nice, and all of that is to a certain degree important in it's own rite - but the most important thing about Christmas is absolutely not the presents, Santa, or a clean house - it is Jesus. I love the song "Silent Night". 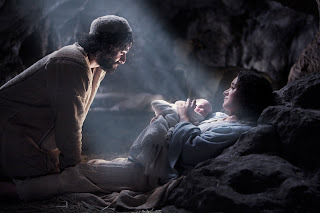 It illustrates beautifully what the most important part of Christmas really is. There truly is so much to celebrate at Christmas. It is an amazing time of year where you get to spend time with the people you love more than anyone else. You get to spend time celebrating. You also have the opportunity to bless others and teach them about Christ. One of the most rewarding aspects of the Christmas season for me is seeing my son start to grasp the reason for this wonderful Holiday. Merry (early) Christmas to everyone! What are some of your favorite traditions at Christmas time? What is your favorite Holiday and why? We have a new family ornament every year. I really enjoy looking over the tree at night when all the lights are off in the house (except the tree) and remembering past Christmases.